Researcher says study was first long-term look at high-fructose corn syrup in animals. (CNN) -- Acolytes of "Food Rules" guru Michael Pollan and other well-meaning foodies who've made corn a scapegoat for the nation's health crises have welcomed a new study from Princeton University that suggests high-fructose corn syrup causes more significant weight gain than table sugar. But the findings have been criticized by food science experts and industry veterans, who say the study unfairly demonizes corn syrup and implicitly absolves cane sugar of responsibility for making Americans fat. "The debate about which one is better for you is a false debate, because neither of them is good for you," says Elizabeth Abbott, author of the forthcoming "Sugar: A Bittersweet History." Researcher Miriam Bocarsly counters that the study wasn't designed to demonstrate "what sugar does for the body." Instead, her team set out to uncover what happens when rats subsist on a diet rich in high-fructose corn syrup for six months. They reported that rats fed water sweetened with high-fructose corn syrup developed more belly fat and had an increased level of circulating triglycerides, fat's chemical form in the body. "As far as we're aware, this is the first long-term study of high-fructose corn syrup in animals," Bocarsly says. "That's important, because you don't eat high-fructose corn syrup once; you eat it every day, probably since you were a child. But you don't see too many studies with humans because you can't keep someone in the lab for 10 years and make them eat high fructose corn syrup." 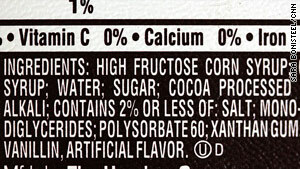 According to Bocarsly, scientific results embraced by the refined corn crowd, including a 2008 statement by the American Medical Association that high-fructose syrups do not contribute more to obesity than other caloric sweeteners, used data drawn from short-term studies. Detractors point out what they say are even more devastating flaws in the Princeton study, including the decision to examine male and female rats in separate experiments and to attribute significance to statistically indistinguishable weights. "I'm skeptical," leading food policy scholar Marion Nestle writes in a blog post. "I don't think the study produces convincing evidence of a difference between the effects of HFCS and sucrose on the body weight of rats." Bocarsly responds: "What we did in the lab was what was most interesting scientifically. We're a behavioral neuroscience lab, so what we're interested in finding is how these foods affect your brain chemistry. We hope this is the first step in a long series of research." Makers of high-fructose corn syrup were not pleased by Bocarsly going public with admittedly preliminary findings, which they suspect some consumers will interpret as another reason to avoid high-fructose corn syrup. Audrae Erickson, president of the Corn Refiners Association, characterizes the study as an example of "efforts to disparage high-fructose corn syrup and perhaps drive it out of the marketplace." "No one ingredient could possibly be responsible for all the diseases attributed to this natural sweetener," Erickson says. "We believe consumers are being misled into thinking there's something different about this sweetener." Pepsi recently tried to capitalize on the anxiety surrounding high-fructose corn syrup, stoked partly by food policy critics such as Eric Schlosser and lifestyle gurus including Andrew Weil. The company late last year debuted throwback versions of Pepsi and Mountain Dew featuring "real sugar." But Abbott, who's chronicled the Western world's obsession with sweetness, says the distinction between sugars from different sources is being overplayed. Eaters just want to have their cakes and eat them without worrying about wellness too. Depicting cane sugar as a healthy sweetener creates an appealing solution to that bugaboo, she says. "By having cane sugar, you're not doing yourself a great big favor," she says. "Not so much sugar is what we should be striving for."